Review written by and copyright: Rick Curzon (3rd October 2016). Sent to prison by a military court for a crime they didn’t commit, these four commandos escaped from a maximum-security stockade and now survive in the Los Angeles underground as soldiers of fortune. Join B.A, Hannibal, Murdock and Face in all 97 episodes from all 5 seasons of this groundbreaking show, now fully restored and in hi-definition… in this action-packed 22-disc Blu-ray set! So, if you have a problem and there’s no one else who can help, and if you think you can find them, maybe you can hire The A-Team. Over the last few years we have been spoiled for choice on Blu-ray when it comes to vintage television appearing on the format from various countries around the world: The Persuaders (1970-71), Battlestar: Galactica (1978-80), Star Trek (1964-69), Space: 1999 (1974-76), The Prisoner (1967-68), The House of Cards Trilogy (1990-95), Miss Marple (1984-92), UFO (1969-70), Thunderbirds (1964-66), Buck Rogers in the 25th Century (1979-81), Columbo (1968-2003), Agatha Christie's Poirot (1988-2013), Star Trek: The Next Generation (1987-94), The X-Files (1993-2002) amongst others. Fabulous Films in the UK have secured the rights to several classics from the Universal TV back catalogue: Knight Rider (1982-86), Magnum P.I. (1980-88), Miami Vice (1984-90), The Incredible Hulk (1977-82) and perhaps one of the most eagerly awaited The A-Team (1982-86). I know plenty of pals who'll be chuffed as hell that this has finally made the upgrade to HD and joined other fondly remembered gems from our childhood. So how does this comedy action favourite shape up on Blu-ray? 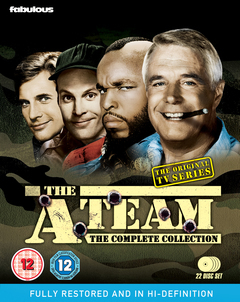 The A-Team was shot on 35mm film and as such is a perfect fit straight out of the vault for HD; none of your standard definition videotape here, just high quality, high resolution film.....and I'm happy to report that it looks a peach! If anyone reading this has other US TV shows like Galactica and Buck Rogers on Blu-ray then you'll know what I mean. This was shot, assembled, edited and post-produced entirely on film and therefore doesn't require an expensive rebuild ala Star Trek: TNG with newly rendered CGI, or a rebuild with upscaled SPFX ala X-Files. Bold, bright, colourful images that hold up nicely with bold colours, good black levels and plenty of detail, especially in well lit sequences. I checked every single episode (97 in all) both visually and aurally and they all look great. I didn't see any signs of damage or artefacts; no crush, no mosquito noise, no aliasing and no evidence of poor encoding. These discs hold between 4-5 x 45-48 minute episodes each and are all BD50s with duel layers. The only downside is that these almost certainly are aged masters dating back some years, possibly 1-2K in resolution so some softness is to be expected. Also, on the season three 2-parter "The Bend in the River", the syndication 2-part version seems to have been used and some footage is missing (approximately 4 minutes). Picture perfectionists will probably pick fault with these transfers (don't they always online?) but for the vast majority of punters and fans these transfers will be the business. Seasons 1-4 are presented in the original English DTS-HD Master Audio 2.0 Mono. These tracks are loud, and robust but are obviously not going to have the explosive effect of a modern 5.1 track, but they are lossless and that is a good thing. You get plenty of bang for your buck with these and I found them so loud that I had to turn the volume down. Season 5 is in it's original English DTS-HD Master Audio 2.0 Stereo Surround track. This is serviceable as it's very, very front centric. I noticed some separations on the front soundstage but very little real surround activity. Obvious when the music starts pumping out and there's an explosion of two they do become active, but once again don't expect anything spectacular. Had the money been available this would have been a shoe-in for a total 5.1 upgrade, if only for season 5 (the one co-starring Robert Vaughn). However, Fabulous Films have very limited budgets and they've done a bang up job with this release so I'm not complaining. Alas, there are no subtitles. Not much alas, but then this is a budget release as regards these kind of things. Rumours of Soldiers of Fortune: Interview with Stephen J. Cannell (SD, 1.33:1) (10:39) - This is a short interview conducted (I'd say) quite a while before Cannell's sad death in 2010. It's way too short, but as far as these things go it's nice enough. Cannell comes over as a garrulous, intelligent guy with a sharp memory. His story about the conception of the series with Brandon Tartikoff is very interesting. I just wish this had been a good solid hour or more. The Great '80's TV Flashback (2005) (SD, 1.33:1) (29:00) - A half hour puff piece filled with talking heads and pundits discussing various Universal-owned TV shows with clips etc. Fabulous Films have done a great job bringing this of the shelf release to the fans; don't expect a detailed, lavish, expensive, curated release and or brand new transfers in 4K and you'll be pleased. This is a welcome addition to the HD TV cannon and is likely to be THE definitive release of the series as rumours are the forthcoming Mill Creek release in the USA will be overly crammed (5-6 episodes per disc) and with lossy sound. Here you get 4-5 episodes per disc and the sound is very bouncy and robust lossless DTS-HD Master Audio. This is a classic slice of TV of the kind that makes people who were there very happy with a warm glow of nostalgia and it's nice to see the series looking so good, like it was shot yesterday. The great, cantankerous George Peppard is no longer here but he'll be looking down from above with a cheesy grin and a stogie with approval. It's expensive (list price £149.99) but deals online will be available and it'll knock the spots off the cheaper US release as regards quality. Get it pre-ordered.